Laurie graduated from the University of Western Ontario in 2009 with a Bachelor’s of Science in Nursing. Since graduating she has been committed to the profession of nursing in both hospital and volunteer settings. 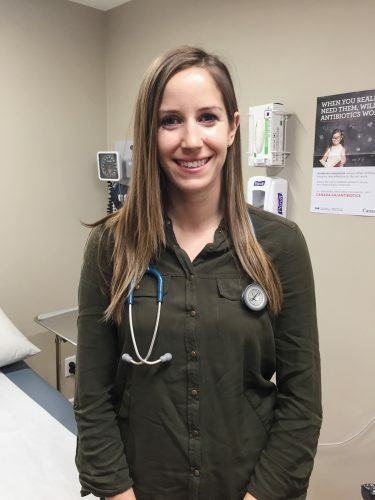 Laurie has worked for the past eight years in various areas of health care including: paediatrics, emergency/trauma, geriatrics and primary care. Laurie has cared for patients and families of all ages with multiple illnesses and injuries. She has volunteered with ChildCan, Society of Saint Vincent de Paul, and Camp Oochigeas, a camp that provides children with cancer an opportunity to attend camp. Throughout Laurie’s nursing career, she wanted to have a larger role in caring for children and their families. Thus, she returned to Western to complete the combined Masters of Nursing and Primary Health Care Nurse Practitioner program. This educational advance has provided Laurie the autonomy to provide primary and preventative care to families throughout their life journey, as well as episodic care to those in need. Katie graduated from George Brown College in 2011 with a Practical Nursing Diploma. Since graduating she has gained experience in a variety of health care settings including: acute care, corrections, long term care and home and community care. Over the last seven years, she has worked with patients across the lifespan, with a focus on adults and seniors with chronic diseases. Katie spent two summers nursing in remote and northern areas of Canada and developed a passion for providing care in rural communities where access to services is limited. She is committed to filling in the gaps in the health care system and address the health care needs of our most vulnerable communities. Tracey is the newest member of the Hub team. She is an experienced member who has spent the last eight years in office administration in medical settings. Prior to administration, Tracey owned and operated Christmas Tyme in Huntsville for 20 years. She has been happily married to Bob (a Huntsville town councillor) for the past 28 years and has two boys who are attending university. Tracey loves to talk about her boys, so feel free to ask about them anytime.